The Sheah Blue Vineyard property is located in the beautiful rural farm area of S.E. 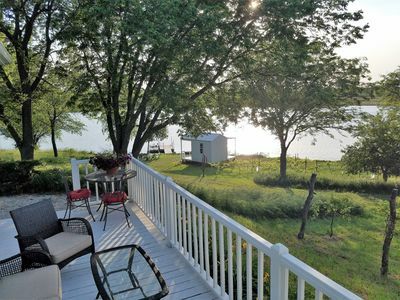 Nebraska, on a 34 acre private lake, just one hour south of its capital city Lincoln. Very private. Our closest neighbor is 1 1/2 miles away. The Vineyard cottage is where we lived for 7 months while the main residence was being built. It is very cozy and a relaxing place to stay. Lots of windows facing the lake, a front porch and a large side porch that also faces the lake and overlooks some of the vineyard patches and farm lands in the distance. A terrific lake for canoeing and fishing. Their is also an outside barbecue grill and a nightly fire pit by the water. All guest are allowed to roam the vineyard property, flower gardens, and shore line. The sunsets over the lake are usually fantastic. We hope to see you soon at Sheah Blue Vineyard.